Vincent Gray defeated Yvette Alexander two years after losing his bid for a second term as mayor during a federal investigation. Alexander was one of three incumbents endorsed by Mayor Muriel Bower who lost their primaries Tuesday. Council member Brandon Todd, who also was endorsed by Bowser, won the primary for the Ward 4 seat Bowser held before him. Two years after Vincent Gray lost his bid for a second term as District of Columbia mayor amid a federal corruption probe, he has assured himself a return to elected office in the nation's capital. Gray, 73, won a Democratic primary Tuesday for a D.C. Council seat representing his home ward, defeating incumbent Yvette Alexander. No Republican or third-party candidates have filed to run for the seat in the heavily Democratic ward. Alexander was one of three D.C. Council incumbents ousted in the primaries. News4's Tom Sherwood reports on the big local races up for grabs. In Ward 8, Councilmember LaRuby May lost to Trayon White. And Councilmember At-Large Vincent Orange lost to Robert White. Gray defeated Democrat Adrian Fenty in 2010 after the brash young mayor alienated many voters, particularly African-Americans. Allegations of corruption in Gray's campaign began to surface just weeks after he took office, and the U.S. attorney's office launched an investigation that ultimately led to six guilty pleas from people who helped Gray get elected. The probe revealed that an influential businessman poured $660,000 in illegal cash into the campaign, and prosecutors said in court that Gray knew about the illicit funding scheme. Gray denied all wrongdoing, and the investigation ended in late 2015 when prosecutors decided not to charge him. On the council, Gray could be an antagonist to Bowser, who defeated him in the 2014 Democratic primary after painting him as corrupt. He refused to endorse her after her victory, and the two are not on speaking terms. However, their differences are rooted more in personality than politics: Both are mainstream Democrats with liberal views on social issues and strong ties to the city's business community. Gray's home ward is east of the Anacostia River, a section of the city that struggles with crime, poverty and unemployment. Voters there appeared to be skeptical of the investigation even in 2014, when Gray defeated Bowser in the ward by a 2-to-1 margin. Gray remains bitter about the investigation, particularly the timing of public statements by prosecutors that led many observers to believe he would soon be charged. But he said this year's campaign has allowed him to regroup and focus his energies on public service. 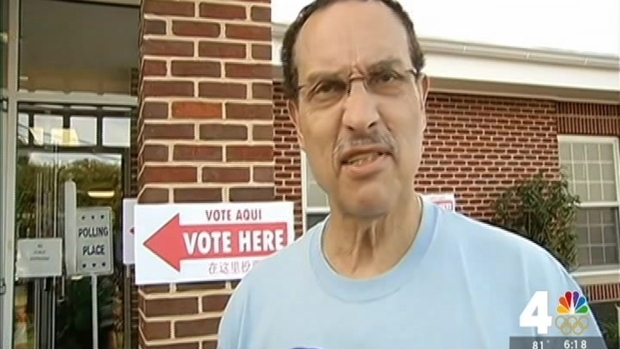 Former Mayor Vincent Gray is attempting a comeback in DC's democratic primary. 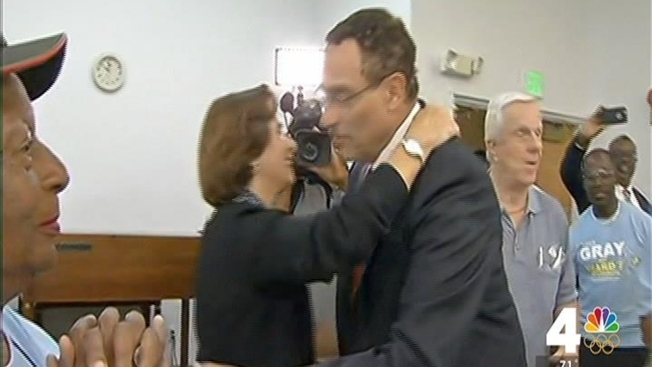 News4's Tom Sherwood has a preview of his battle with incumbent Yvette Alexander. "I'm moving forward," Gray told The Associated Press as he greeted voters outside a polling place. "Otherwise, it'll eat you alive." Bowser greeted voters at polling places across the city, urging them to support Alexander and other council incumbents whom she considers allies. However, her efforts fell short in the Gray race and in a neighboring ward east of the Anacostia, where council member May lost to White, a 32-year-old nonprofit founder and community activist. Gray endorsed Alexander when she first ran for the Ward 7 seat in 2007, then she backed him for mayor. Gray had more endorsements, particularly organized labor, and more money. D.C. Democrats also backed Hillary Clinton in the final Democratic primary election in the nation. Bernie Sanders held a campaign rally in the District last week, the same day President Barack Obama endorsed Hillary Clinton after she clinched the nomination. The D.C. Council will get a new member in the ward once represented by former Mayor Marion Barry as White defeated incumbent Council member May Tuesday. His victory means new representation for both of the city's wards east of the Anacostia River. May raised 10 times as much money as White. Barry represented the ward on the Council for 10 years until his death in November 2014. May won a special election to replace him. Orange, who returned to the council in 2011 after previously serving as the Ward 5 Council member from 1999-2007, conceded defeat in the primary for an at-large council seat. Unofficial results from the Board of Elections have White, of Brightwood Park, with 40 percent of the vote to 37 percent for Orange. David Garber, 32, of Shaw, got 15 percent. White has been serving as director of community outreach for Attorney General Karl Racine. This was his second try for an at-large seat. He ran the first time as an independent. One of the four council members endorsed by Bowser held on to his seat. Brandon Todd won a special election for Bowser's Ward 4 seat when she was elected mayor. She endorsed him then and did so again, and Todd got 51 percent of the votes. His main challenger Leon Andrews, was second with 42 percent. Arlington Board Chair Libby Garvey has been in public office there for almost 20 years. Her seat was challenged by Erik Gutshall, a planning board member who received a number of endorsements from people wanting change. Garvey won with 55 percent of the vote. "I am proud to go on to November to represent you as the Democratic nominee for county board," Garvey said in a statement. "Now that the primary is over, it's important that we come together as Democrats to ensure we keep Arlington blue, from the White House to the School House,” he said.